Lovely little new creations. Found some cheap and decent magnets a while ago. 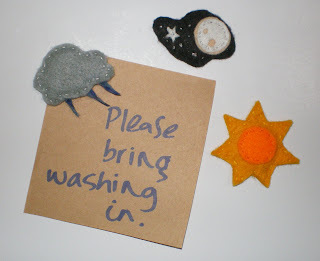 Finally put them to use and made these felt magnets that are now on sale in my store. I've sewn the magnets inside so the back surface where it attaches to the metal surface won't get scratched by the magnet. I like this sky set. I like the rain cloud best. It was lovely and wet here today. It rained properly--not the pathetic drizzling it often does. I love it when it rains. I have plans to make more magnets too. So many ideas.